Although I’m not really the person that anticipates or celebrates this once celtic, irish-catholic or whatever holiday known as “Halloween”, I still enjoy the overall theming and specials you’d see on TV and what not. And so I got a little bit inspired by the current season (and actually some Videos I saw online) . So I came up with this lil piece of artwork. As for Viola’s design, I tried to stay true to the commonly known depiction of witches with the pointed hat, a relativly dark dress and the Broomstick just like your average witch. I also added those hexagonal “star accessoires”, this somehow starts to sound like a presentation of a new clothing line, and this Victorian jabot to give a bit of a victorian-steampunk vibe to her. But I tried to remain this simplicity in her design so she would still look like the witches you see nowadays. 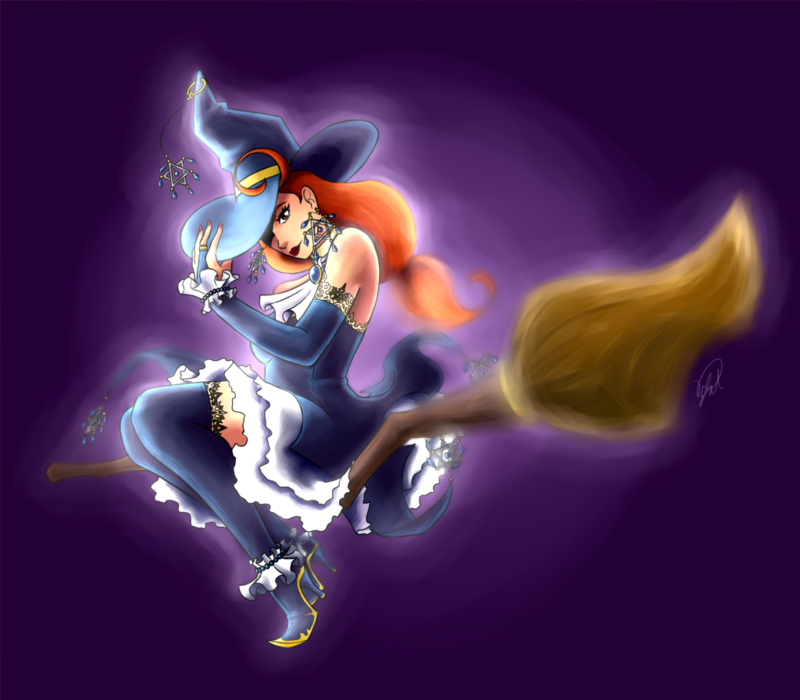 I say nowadays, because I looked up the Wikipedia article about witchcraft, more precisley the european kind, to get some impressions and ideas for her design and stuff and… well… Fun fact: The Broomsticks were held kinda differently back then. Atleast in some depictions… And after searching a bit I came across an interessting little article back from 2001 and also found out that the differences could have been a continental vs British Isles thing. Looks weird but still has something to it… Also they were always naked, dunno why tho. The usual oldschool paintings I guess. As for her Name, I looked up some Victorian names, because I found it fitting with her design, and decided for “Viola” because of the already violet background. Since she’s now the seventh character I posted here on this site (and the I-don’t-want-to-count-them-anymore-th character I came up with in total) I have this urge to actually do something with them including the one from the last drawing I uploaded back in June. 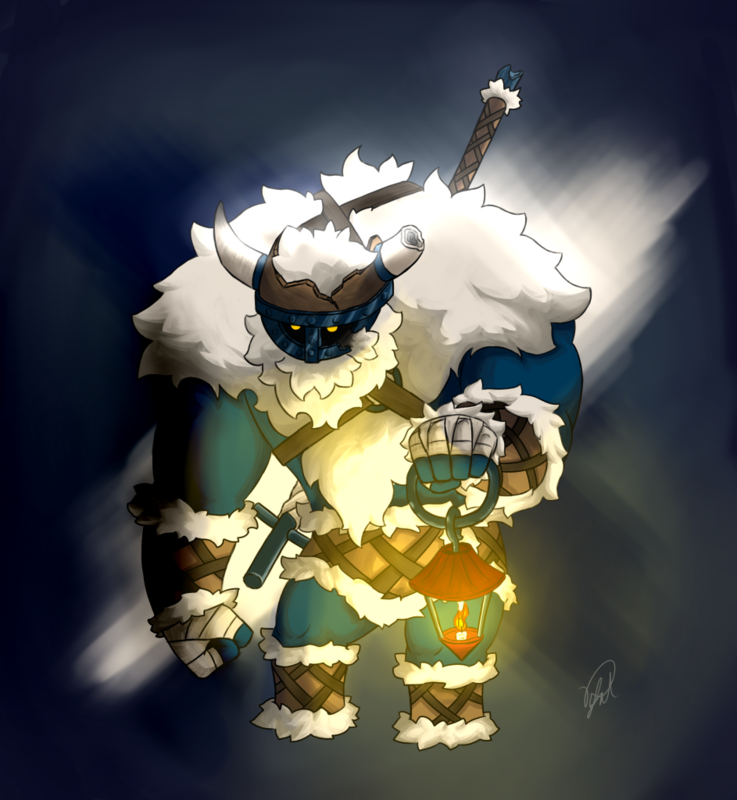 “Jotun”, as you might know (depending on your interest in Norse mythology) is the simplified term for the giants of Norse Mythology. And with that, the title of the picture means “Giant – The Giant”. And I’m ok with that. As for his design, it’s inspired from Shovel Knight’s Polar Knight and has, with his given name, a somewhat viking-ish flaire. Also with the fur, and the pelt, I guess a colder environment as his habitat is pretty self-explanatory. Although those horned helmets weren’t actually worn by vikings, which is a common myth! With my huge interest in gamedesign and games in general (thanks to some persons and their blogs like this (german)) and my posession of the RPG-Maker 2k3, I thought about creating a game with some of the recent characters I came up with, while as mentioned, already thinking of their usefulness in an RPG-setting. And because of that, I’d like to save more details of these two characters for a later blog. Since I’m still little to none experienced when it comes to gamedesign, character or story writing, which is why I’d like to use this in means of gaining experience in those fields, I really don’t know what to expect from the outcome of this project that I’d like to share here. So don’t expect some top notch triple A Indie RPG Maker game coming your way (as if), but more of an documantation of me being a tryhard when it comes to creating something. With both, Viola and Jotun released here on Aelizebeth there are only six more I have in mind and look forward to drawing them. And with that I mean actual artworks because I have half of a note book full with sketches of them. I guess I should also say that my focus, obviously, lies more on the visual design of characters and I definitly, again, wouldn’t consider myself as an experienced character writer. I just try to not make them cringeworthy or dull. Now after reading this, or me projecting my thoughts on you, you might think: “Six more?! What about those five characters in that one drawing from back don’t-know-when?” Those are characters I actually had in mind for something else so that’s something for another blog entry, although I tried to get them in an RPG-setting but I think that didn’t work out that well in concept, so that’s the reason I wanted to create more characters in the first place.